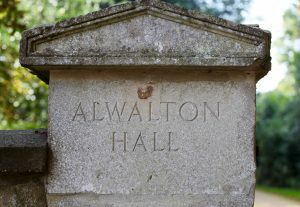 Once upon a time, Alwalton Hall was actually Alwalton House. Looking at the, now partly plastered, red brick wing of Alwalton Hall it is believed this original part of the house dates back to the 1780s. 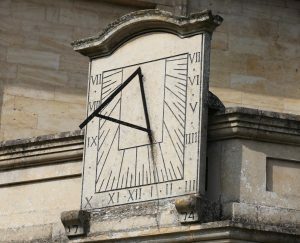 The sundial, which survives above the garden room at Alwalton Hall, also suggests that part of the building dates back to at least 1774. It’s believed this, older, section of Alwalton Hall was constructed for William Fitzwilliam, 4th Earl Fitzwilliam, who later took the additional name, Wentworth. 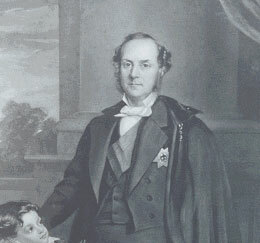 When he died aged eighty-four in February 1833, his estates, including Alwalton House, passed to his son and heir, Charles William Wentworth Fitzwilliam, 5th Earl Fitzwilliam, for whom Alwalton House was enlarged and renamed Alwalton Hall. 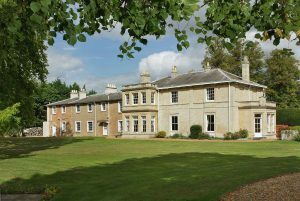 Named Alwalton Hall from 1851, the limestone part of the building was likely added between 1841 and 1851 – making it a much larger residence! During this time Alwalton Hall, according to the 1841 census, was the home of Lady Mary Thompson, the second daughter of the 5th Earl Fitzwilliam, and her husband, Leonard. Lady Mary Thompson was believed to be a real character! She was a keen supporter of the Volunteer Movement, a division of the militia with the primary role of defending against invasion – a very real threat during the French Revolutionary and Napoleonic wars. Alwalton Hall was then home to a string of Hon. 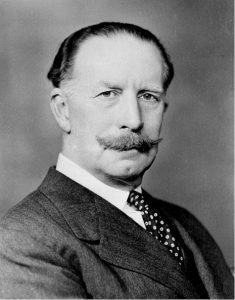 Wentworth-Fitzwilliams, notably the spendthrift eighth son of the 6th Earl Fitzwilliam. On 6 October 1909 The Times reported that the Hon. Miss Kathorn Wentworth-Fitzwilliam of Alwalton Hall, “the daughter of the late T. Fitzwilliam and cousin of the Earl Fitzwilliam”, married at Alwalton Church James Auchinlech Dane, an officer in the Royal Field Artillery and the son of a judge. Alwalton Hall was later purchased by Joseph Stephenson, who remained at Alwalton Hall until the onset of the Second World War in 1939. In 1948 Alwalton Hall was acquired by Francis Arthur Perkins [1889-1967]. Along with four other men, Francis founded the Perkins Engines Group in a Peterborough back street in 1932. Two years later he drove a car powered by one of his new engines to Moscow on a sales promotion trip. In 1933 he claimed the world speed record for a diesel engine with a run of 100 mph on a track at Brooklands. The high-speed diesel engines, which Frank Perkins manufactured to his own patents, were in high demand, not least by the Admiralty and the RAF for air-sea rescue launches during the Second World War. In 2004, Brian and Maggie Jones bought Alwalton Hall as a family home for them and their five children. In 2017, Brian and Maggie were delighted to transform Alwalton Hall into the beauty and wellness sanctuary you know today.